February Workshops: Macaroons and Chocolate Souffles! 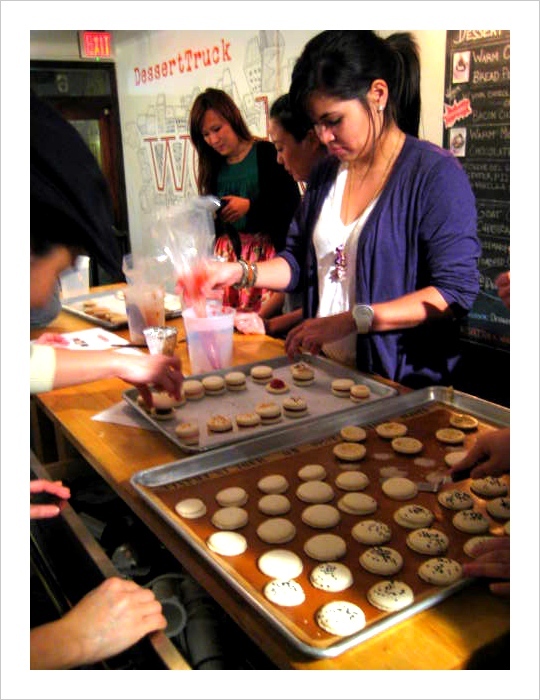 Both the macaroon and souffle classes are $45 per person and sign-up happens through Google Checkout here. The “quantity” is the number of people you would like to RSVP for. If you prefer not to use Google Checkout, please reserve your spot at our cafe, DessertTruck Works between the hours of 3pm and 11pm. We accept all major credit cards. The cafe is closed Mondays. When you arrive at the workshop, you will receive a complementary coffee or espresso drink as well as a packet containing an outline of the class as well as the recipe you will be working on. This is not just a demo. You will be making the macaroons or souffles yourself and will get dirty! (which is more fun anyway!) You’ll also be taking home some of the desserts you’ve made. If you have any questions, please do not hesitate to email us at mail@desserttruck.com.